is used to create 2 instances of the peers and following code to connect them with each other. But that was to connect them in the same program where it's running. I want to connect them accordingly for different computers. Been stuck here for hours. I don't know how to use this. 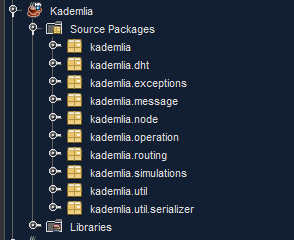 According to Kademlia protocol you can find in here, "To join the network, n node U must have a contact to an already participating node W. U then performs a node lookup for it's own node ID." You should have two instance of the nodes. You can bootstrap the node2 from node 1. Not the answer you're looking for? Browse other questions tagged java sockets dht kademlia or ask your own question.